Moving to Charlotte might be the best decision you'll ever make. If you want city-life that has its own local charm and isn't wildly inexpensive, The Queen City is your place. It's easy enough to get around with CATS (the Area Transit System) or by car, though if you live in the right neighborhood like NoDa, you'll probably never leave. In terms of business, the city has a lot going for it. It may have a lower cost of living (23% below the national average), but that does not prevent it from being the nation's second largest financial center. Wells Fargo and Bank of American are even headquartered here and are two of the region's largest employers. But you can't forget the local businesses that make Charlotte what it is, such as its intense brewing scene. There are about a dozen local breweries throughout the city that have received high ratings and reviews for their variety of tasty brews. If there is one neighborhood that has experienced a type of rebirth, it would be NoDa (North Davidson). What was once a neighborhood for textile manufacturing and mill workers and later experienced a decline into poverty has seen its own type of renaissance that took place in the 90s. Now, the neighborhood boasts the city's arts district with an array of art galleries, music venues and restaurants. If you are looking for homes for rent, you better look elsewhere because NoDa is known as being an apartment renter's neighborhood. There are many apartments for rent in NoDa that vary from renovated warehouses to traditional apartment complexes. You can find studio apartments and luxury apartments pretty easily in NoDa, but if you want a pet-friendly or all bills paid apartment, try using an apartment guide. Speaking of art, Charlotte is known for its prominent art community. Both local which you will find in the numerous art galleries in NoDa, to institutional art venues such as the Museum of History, Mint Museum and Bechtler Museum of Modern Art. If art isn't your thing, or maybe you just like to do other things, there are over 30 golf courses Mecklenburg County as well as numerous natural sights to see such as the Daniel Stowe Botanical Garden or going boating on Lake Norman. The city is home to the University of North Carolina at Charlotte, though it's not quite in town, but northeast of downtown by 20 about minutes. This is great for students because it means that student housing isn't in the middle of already expensive areas. Instead, you'll find cheap apartments for rent with utilities included pretty easily in and around University City. If you are looking for a house for rent near the university from out of state, your best bet will to apartment search with an apartment finder. 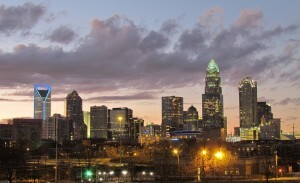 RentLingo is your trusted apartment finder in Charlotte. We hire local experts, such as former property managers and locators to anonymously tour and consistently rate and review every available place. They share their honest and unbiased perspective with you, so you know how every rental ranks in the area. Because our experts tour every property, we can offer consistent apartment ratings across every region. So unlike finding a Backpage or Craigslist rental, you can trust these apartments are verified and trustworthy: whether it's a cheap studio or a one bedroom with all utilities paid all the way up to a nice house for rent or a luxury condo.